Artist's illustration of the Giant Magellan Telescope (GMT), which will be built atop Las Campanas Peak in Chile. The groundbreaking ceremony for GMT, which will feature seven mirrors arranged to form a light-collecting surface 80 feet (24 meters) wide, is scheduled for Nov. 11, 2015. Construction will begin this week on a giant new telescope in the mountains of Chile, and Space.com will be there to take in the milestone moment. The groundbreaking ceremony for the Giant Magellan Telescope (GMT) — a huge instrument that astronomers will use to hunt for signs of life in the atmospheres of alien planets, probe the nature of dark energy and dark matter, and tackle other big cosmic questions — is scheduled to occur Wednesday (Nov. 11) at the Las Campanas Observatory in the Chilean Andes. When it's finished, the GMT will consist of seven 27.6-foot-wide (8.4 meters) primary mirrors — the largest single-piece astronomical mirrors ever made — arranged into one light-collecting surface 80 feet (24 m) across, as well as seven smaller secondary mirrors that will change shape to counteract the blurring effects of Earth's atmosphere. The finished observatory will boast about 10 times the resolving power of NASA's famous Hubble Space Telescope, GMT officials have said. Four of the 20-ton primary mirrors have already been cast, at the University of Arizona's Steward Observatory Mirror Lab. All four should be fully polished (a time-consuming, exacting task) and delivered to Las Campanas by late 2021, allowing the telescope to begin science operations around that time, said GMT director Pat McCarthy. 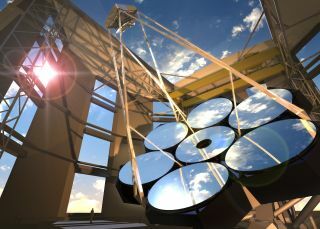 "That will give us the world's largest telescope by more than a factor of two at that point," McCarthy told Space.com in September, shortly after the casting of the fourth mirror had been completed. Primary mirrors number five, six and seven will probably be installed at the rate of about one per year after that, bringing the GMT up to full strength around 2024 or so, he added. Two other megascopes should also be coming online at about that time — the Thirty Meter Telescope (TMT) in Hawaii and the European Extremely Large Telescope (E-ELT), which, like GMT, will view the heavens from the Chilean Andes. TMT and E-ELT will combine hundreds of relatively small mirrors to form light-collecting surfaces that measure 98 feet (30 m) and 128 feet (39 m) wide, respectively. These three enormous ground-based observatories — along with NASA's James Webb Space Telescope, which is scheduled to launch in late 2018 — should usher in a sort of astronomy golden age, McCarthy said. "About seven to 10 years from now, there will be observational capabilities that are completely unprecedented," he said. "I expect we will make a big leap in our understanding [of the cosmos], but I also suspect that we'll find out that some of the things that we believe now turn out not to be quite correct. Often in science, the more you learn, the more you realize that there's a lot to learn."